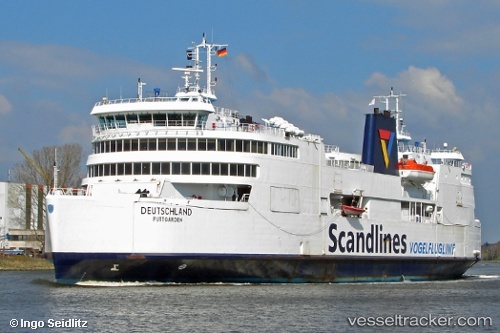 In the afternoon of June 7, 2017, the German ferry "Schleswig Holstein" went back on the track at 3.30 p.m. as the first ferry of Scandlines which had temporarily suspended all traffic between Germany, Denmark and Sweden due to an unspecified bomb threat by telephone. The ship was sailing without passengers and cars. Shortly thereafter the "Deutschland" from Rødby arrived. In Gedser the "Berlin" started sailing again. Both the route Puttgarden - Rødby and Rostock - Gedser were affected. In Puttgarden the ferries "Kronprins Frederik", which is used for dangerous goods, and "Prins Richard" were held in the port. They had already been unloaded and were searched in the course of the afternoon for explosives. The Danish police cleared ferries in Rødby and Gedser for safety reasons. They had got a clue that made it necessary to investigate the ferries in the two ports. The passengers had left the ferries sailing between Rødby and Puttgarden on Fehmarn as well as Gedser and Rostock. The eviction took place quietly and without drama. The "Copenhagen" was sidelined in Rostock by late afternoon, and the "Deutschland" remained at the quay in Rødby in Denmark, the Lübeck police said. She and the "Prinsesse Benedikte" were temporarily unable to leave port because of the situation. The water police Travemünde established a steering committee and was examining further measures in close cooperation with the Danish counterparts. In Puttgarden traffic was massively affected. Until the evening all rail connections were canceled. Cars and trucks were standing in long queues at the ferry terminal and on the evasive parking lots, which were almost completely occupied. In the night of Oct 17 the "Deutschland" assisted a distressed yacht crew off Fehmarn. The 13-m-yacht "Sunte Mareiken" was transiting from Eckernförde to Greifswald when it suffered water ingress off Puttgarden and went adrift in 7 bf wind. The lifeboat "Emil Zimmermann“ rom the station Puttgarden was launched, and the "Deutschland“ as well as the anti pollution vessel "Scharhörn“ proceeded to the yacht which was about 4 nautical miles off Puttgarden. The "Deutschland" lowered its fast-rescue-boat to be able to evacuate the crew of two, while the "Scharhörn“ remained on standby. The crew of the fast rescue boat jointly with the "Emil Zimmermann" was able to cope with the flooding with capable pumps so that the "Deutschland" could resume its service and the "Emil Zimmermann“ was able to pull the "Sunte Mareiken“ to Puttgarden around 6.30 a.m.